Magneto and Graviton: Who would win a fight? If Magneto and Graviton Would Battle, Who Would Win? Photo illustration by Slate. Photo courtesy of Alan Markfield/Marvel and Twentieth Century Fox Film Corporation. I have to put a vote in for Graviton. Assuming the laws of physics still apply to the world of Magneto and Graviton, then Magneto has to still respect Maxwell’s equations, and Graviton has to respect the equations of general relativity. Therefore, we have to assume that Magneto can create electrical charges and magnetic monopole charges of any magnitude in space and can also create currents of these charges. This would allow him to manipulate the source terms of Maxwell’s equations, and that will enable him to create any electrical and magnetic field consistent with Maxwell’s equations. On the other hand, the source of gravity is the 10-component stress-energy tensor, so we will assume Graviton can create any configuration of the components of that tensor in space time to manipulate the resulting gravitational field. The most interesting components of this tensor are the mass-energy density (T00) and the pressure (T11, T22, T33). To allow them to have any superpowers, we will assume that Magneto can violate the conservation laws for charges and currents and that Graviton can violate the conservation laws for mass/energy and pressure. If they did not have this ability, they would be greatly limited in what they could do. One thing in Graviton’s favor is that all mass and energy are subject to the laws of gravitation, whereas only charged or magnetizable objects can be affected by the electromagnetic force. An example of that difference is that on cosmic distance scales electromagnetic fields have practically no effect at all. However, gravitation has, until recently (i.e., 5 billion years ago) been slowing down the expansion of the entire universe since the Big Bang, and now the gravitational effect of dark energy has accelerated that expansion of the universe—this accelerated expansion is caused by a small constant vacuum energy that permeates space with a negative pressure. Of course, gravity is also responsible for the formation of galaxies, stars, and planets. Sure, with a strong enough electric field, Magneto can disrupt any object made from ordinary matter by converting it into a plasma of electrons and nuclei, thus destroying it. However, Graviton can create a black hole around any object that will also destroy it. 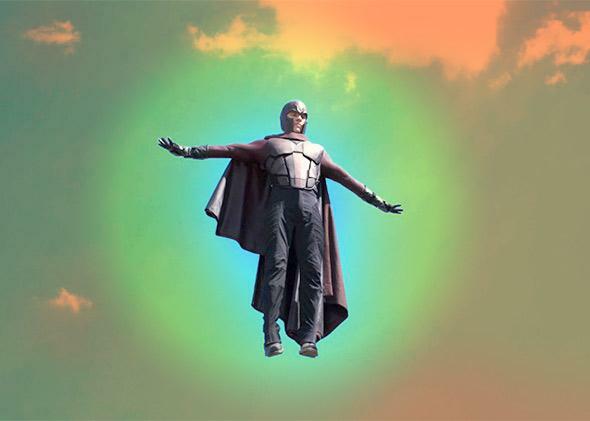 In fact, if Graviton creates a black hole around Magneto, it would not only destroy him by taking him out of our universe but also eliminate any ability for him to project his electromagnetic field out of the black hole, since nothing can escape from a black hole. However, a black hole can support a static electric charge, so if Magneto is quick enough, he could create a big enough charge on his body so that the black hole would be charged—and in fact, if the charge is large enough it could prevent the black hole from forming, since for a given mass of black hole there is a maximum charge for a black hole of that mass. In this case, Graviton would just have to increase the mass of the black hole he is trying to create faster than Magneto can increase the charge and a black hole would eventually form. Once it is formed, Magneto would not be able to add any more charge to the black hole, so that would be the end of that. In terms of moving objects (without destroying them), electrical and magnetic fields can be either attractive or repulsive—however that only applies to objects that already have a static electric charge or are magnetic. On the other hand, Graviton can create a gravitational field that is guaranteed to affect all objects of any kind—including dark matter. Of course, gravity is normally only attractive, but all you have to do is put the attractive gravity on the whichever side of the object toward which you want to object the move. However, one of the interesting things about the stress energy tensor is that if there is a region of space with negative pressure, gravitation can be repulsive. In fact, that is how dark energy is accelerating the expansion of the universe—it has a big enough negative pressure so that the overall gravitational effect on cosmic scales is repulsive instead of attractive. So, presumably, Graviton can manipulate the stress energy tensor to create negative pressure wherever he wants and can cause repulsive gravity. Another trick that Graviton can do is to create a region that has a negative mass—this is exactly the kind of exotic matter that is needed to stabilize the opening of wormholes that would permit faster than light travel from one region of the universe to another. Magneto would never be able to do that since his electromagnetic fields can only travel at the speed of light by definition. Really, the only downside for Graviton is that the gravitational force between two elementary particles is very many orders of magnitude weaker than the electromagnetic force between those same particles (see this answer). However, as stated previously, matter has both positive and negative charges that almost always completely cancel; on the other hand the gravity effect is always additive. In any case, that weakness of gravity just means that Graviton will have to use stress energy tensors with component values that are many orders of magnitude greater than the electrical and magnetic charges and currents that Magneto creates. So, I think the real results of a battle between Graviton and Magneto will depend on the powers they have to manipulate the source terms—in other words, how quickly can Magneto ramp up charges and currents to the values he needs compared to how quickly Graviton can ramp up the mass/energy and pressure terms of the stress energy tensor to the values that he needs. Since these parameters have not been specified, it is impossible to say for sure who would win. In summary, I think Graviton has lots of tricks up his sleeve and could probably hold his own and could perhaps even win in a fight with Magneto, but it depends … and I could be wrong. Electromagnetism: Why don’t electromagnetic signals all obscure each other? Hypothetical Battles: If there were a zombie infestation on an American aircraft carrier in the Atlantic Ocean, how would the battle be fought? X-Men: In X-Men, is Magneto insane?